TruGolf golf simulators and software bring a life-like golf experience to clubs, bars and homes around the world. "TruGolf uses Optoma projectors because they handle the unique and diverse throw distances required by our units. Optoma offers a wide range of products that match our unique needs." Challenge: TruGolf sought a manufacturer of high quality projectors with excellent brightness, detail and throw ratios to compliment their line of best-selling golf simulators. Solution: TruGolf chose Optoma as the best choice for projectors for all of their simulators due to the high brightness for rooms with ambient light, the detail of the image projected and the flexible aspect ratios for the various simulators. Results: Year after year, TruGolf continues to choose Optoma projectors for every golf simulator as no other manufacturer can deliver such an extensive line of high quality projectors to fit TruGolf’s needs. TruGolf, the maker of the #1 golf simulation software in the industry, has been building golf simulators for over 10 years. 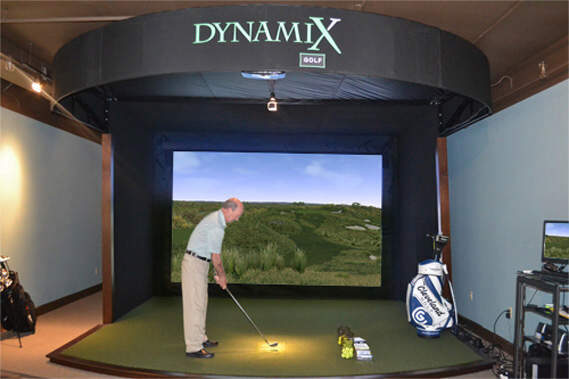 Their simulators have been featured in professional golf clubs, indoor golf centers, bars, cruise ships and homes. TruGolf’s proprietary software features 3D builds of the most popular golf courses around the world in exceptional detail. When choosing the right projectors for their simulators, TruGolf sought a line of projectors that would show the small details of the courses down to how the grass is cut and moves in the wind. For that to be possible, they needed a bright projector with excellent contrast and detail. The TruGolf team did extensive research to find a single manufacturer who could deliver projectors for each of their unique golf simulators from smaller models for the home all the way to large simulators for professional golf clubs. Their throw distances range (on average) from 60 inches to 90 inches and the rooms generally have some ambient light. They desired projectors with flexibility to homes of different sizes and the ability to still capture the artistry of the software. They tried many brands to find a manufacturer that would facilitate all the needs for the different simulators before ultimately choosing Optoma projectors. “TruGolf uses Optoma projectors because they handle the unique and diverse throw distances required by our units. Optoma offers a wide range of products that match our unique needs,” said Mason Jones, Marketing Coordinator at TruGolf. TruGolf continually researches to improve their projector choices to increase the life-like experience of the golf simulators, but always comes back to Optoma for excellent picture and flexibility in aspect ratio. “We haven’t found anything that is better for our needs,” said Jones. Today, all TruGolf simulators use Optoma projectors. Many customers also use the simulators as a double for a home cinema due to the image quality and screen size.